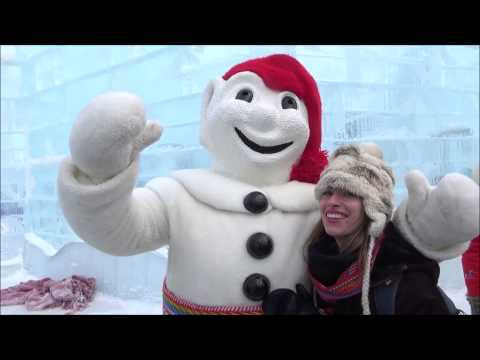 While attending Quebec City Winter Carnival we had a chance to meet with Bonhomme who took the time to talk with us, crack jokes and promote Carnaval. So right now we’re getting ready to go inside Bonhomme’s ice palace. Let’s go visit him. People ask me what I do after Carnival. I travel the world and I invite people to come to this great festivity. My carnival. I even once went to Mexico. It’s a little bit warm. When I got there I was about eight feet as I am usually and when I came back I was five foot four. I melted a little bit. So when did you arrive in Quebec? Two days ago. Hello. You’re not too jealous? No. Okay. Hahaha. Cheese. Is that a video? Yeah, let’s do something memorable. Audrey. And you’re from? Kingston, right? Hello my friends from Kingston, we’re with Audrey right now and we invite you to come to the biggest winter carnival in the world in Quebec City. I love you all and wish you a Joyeux Carnaval. So my friends, you’ve seen my kick right? Get your cameras ready. I’m going to kick it for you. So this is where I train. I hold onto to this and I do my kick. I’ve practiced that so many times that I don’t have to hold this anymore. You want the kick? Yeah. You guys want the kick? Oh, yeah! Say it again. Yeah! Get your cameras ready. I know I’ll have to do it a couple of times because you won’t be ready enough. You ready. One, two, three. Woo! Did you guys get it? Go ahead. This is my museum. This is some of my museum. Some of my artifacts over the years. This is my restroom. Can we say that? Restroom? No. No, not really eh? This is where I rest. So I can stand right here but not for too long because I’m going to melt. Alright. Bonhomme? Bonhomme? There is a question here. Yes. Somebody, where are you from? Toronto. You see where their priorities are. She’s wondering, well actually ask him. Where do you go pee? Hahaha. Hey, are you recording this? Okay, I’ll have to have a political answer then. I don’t have time to do this. I just keep it for myself because I’m being made of snow and ice and it helps to keep it in. There you go. That’s a great answer. I wish you a great day at my carnival. I love you all and wish you a Joyeux Carnaval!